ST. LOUIS—After a seven-year wait, scientists have finally been ableto analyze the cometary and stellar dust particlescaptured by the NASA Stardust spacecraft. Researchers performed preliminary analysis on particles fromsix of Stardust's 132 collectors. Already, they are finding many of the samematerials in samples from the Comet Wild 2 (pronounced "Vilt 2") that they believe formed the early stars,planets, and other objects. While the samples appear to lack indicators of water, they docontain sulfides, a key component to life. "When you have the samples in hand, it's a whole differentuniverse," project leader Don Brownlee of the University of Washington said during a pressbriefing here today at the annual meeting of the American Association for theAdvancement of Science. The early results reveal that the 4.5 billion-year-old cometcontains iron, sulfides, glassy materials, olivine, and what the scientiststermed potentially interesting isotopic traces. They believe that thesematerials were also available during the formation of other objects in oursolar system. Stardust also captured contemporary particles as they passedthrough the solar system. More than a million particles larger than one micron (amillionth of a meter) in diameter are believed to have been captured inice-cube-sized aerogel collectors. Many of theimpacts left carrot shaped troughs in the aerogel,each with a sample at the bottom. "The biggest impacts were big enough to put your littlefinger in," Brownlee said. NASA's other recent comet mission, Deep Impact, revealedcarbonates, hydrated silicates, water ice, clay, iron, and olivine in adifferent comet. "That's the big question: Is there a difference? "Brownlee said of the two comets. Deep Impact hit Comet Tempel 1 in itsbody, which likely had warmed up from millions of years of impacts with otherbodies. Stardust, however, captured particles jetting out from its tail. Manyof the bits are thought to be the original, unadulterated materials that formedthe comet. "We're confident that the things coming out [of Comet Wild2] are the same as those that went in," Brownlee told SPACE.com. "We believe that wecollected the most pristine samples of a comet, those that have never beenwarmed." While further analysis of Tempel 1revealed waterice on its surface, so far no evidence of water has been detected in theparticles. 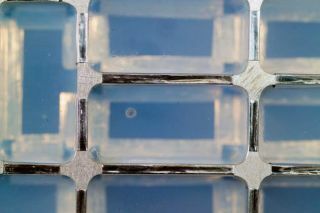 The other sign of water would be the presence of hydrate silicates,which were present in Tempel 1, Brownlee said, but sofar none of these have been found in the Stardust samples. Stardust was launched on it nearly seven-year flight on Feb. 7, 1999 and is a NASADiscovery-class mission. Its encounter and dust-samplecollection at comet Wild 2 occurred Jan. 2, 2004, with the spacecraft flying by the comet at roughly 149 miles (240 kilometers) distance. NASA's Stardust spacecraft successfully landedon the Utah desert at about 5:12 a.m. EST (1012 GMT)on Jan. 15, 2006.The total cost of the mission was about $212 million.